Terry: It wasn’t him, Charley, it was you. Remember that night in the Garden you came down to my dressing room and you said, “Kid, this ain’t your night. We’re going for the price on Wilson.” You remember that? “This ain’t your night”! My night! I coulda taken Wilson apart! So what happens? He gets the title shot outdoors on the ballpark and what do I get? A one-way ticket to Palooka-ville! You was my brother, Charley, you shoulda looked out for me a little bit. You shoulda taken care of me just a little bit so I wouldn’t have to take them dives for the short-end money. Terry: You don’t understand. I coulda had class. I coulda been a contender. I coulda been somebody, instead of a bum, which is what I am, let’s face it. It was you, Charley. The film On the Waterfront is about Terry Malloy, the gifted boxer who coulda been a contender had he followed his heart’s voice instead of that of his brothers is a message of what could happen when you allow someone else to forge your destiny. Now to be clear rarely are destinies created outside the context of other people. Fulfilling our destiny is not something that is done in a vacuum. It is done in the context of our relationship with others. There are many engagements with our destiny that would be essentially impossible if it were not for the positive relationship with at least one other person. An example of this is Helen Keller. At a young age before she fully began to talk, she suffered the ill effects of scarlet fever that left her deaf and blind. Her family and physicians thought she was also dumb as a result of this illness. The family’s hope was for Helen to be well behaved and so they brought in Anne Sullivan to work with her on her behaviors. Anne Sullivan sensed there was intelligence in Helen’s behaviors and began trying to break through in communication with her. And she did. Helen realized that things have names. Anne Sullivan became a mentor for Helen, teaching her how to communicate with the larger world. Helen eventually went on to be the first deaf blind person to receive a Bachelors degree and to write several books. There is a balance that is needed between the individual and the relationships we are accountable to in this life. But what happened in Terry Malloy’s life is that he lost that balance between what his goals in life were and the goals of his brother. His brother wanted to get rich. His brother wanted to rise in the mob world of power. And Terry Malloy, out of his devotion to his brother agreed that his brother’s happiness, his brother’s dreams, his brother’s life were more important than his own. And when Terry Malloy did that he forfeited his own destiny in the pursuit of fulfilling his brother’s. And as we see in the unfolding story his journey back to forging his own destiny was difficult and painful but one that eventually would be regarded with respect and dignity. In the first part of this sermon series, I talked about the different aspects of destiny as defined by Rollo May. There was the cosmic aspect of destiny such as birth, death, and acts of god like tornadoes and earthquakes. The genetic aspect of destiny includes the physical characteristics and limitations of our bodies and minds. The cultural aspects of destiny includes whether we were born into a family of wealth or poverty, the location where we spent our childhood, and the time in history in which we live. And there is circumstantial destiny; those events that happen around us that cannot be taken back or redone such as the loss of a sibling or parent at an early age or a nation declaring war or going into economic recession. So Terry Malloy in our story was born with some athletic talents that enabled him to be a good boxer, potentially a great boxer. This is a genetic aspect of destiny. He was born into a working class family with an older brother who was smart and ambitious at a time when mobs ruled the way things went down. It is a family that taught values of sticking together. This is the cultural aspects of destiny. He becomes involved in the mob that abuses workers with intolerable working conditions and poor wages. Those who speak up about these issues are either replaced or removed by killing them. This is the circumstantial destiny he is surrounded by and he cannot redo what has already happened. In order for Terry Malloy to redefine himself as a person of integrity and worth, he must choose to engage his destiny. He must begin to self-differentiate himself from his surroundings and relationships and not have his identity be fused with them. Self-differentiation is a term that Murry Bowen, founder of family systems theory, developed to describe the ability of being able to separate out ones emotional and intellectual awareness from that of the family or group. This comes from the person developing and considering thoughtfully their principles and values that they will seek to follow rather than simply adopting the views and values of others. This means when conflicts occur, the person is able to assess the situation from a clear perspective and not clouded with the emotional entanglements such as fears of criticism or rejection. This enables the person to hear the opinions of others, respect them, without feeling the need to either adopt those opinions or try to get others to conform to their opinions and values. Self- differentiation includes both a separation from the emotional entanglements and a connection to the person or group through listening to what is happening. No one is 100% self-differentiated but it is a goal that individuals and groups can strive towards in forging destinies for themselves and for the groups where they have aligned themselves. This is not easy work. It is not something that happens over night and suddenly a person is self-differentiated. It is a process. In the movie On the Waterfront self-differentiation resulted in push back from the system. When Terry began to self-differentiate his brother and the mob bosses began to get nervous because Terry was always a submissive person. Terry was the person who wanted above all else to please his brother and that even meant being silent when he witnessed a murder. So Charley, Terry’s brother, tries to get Terry to conform to the mob bosses wishes and desires or risk being killed. Self-differentiation can carry with it risks but in the long run it is a healthier way of being. The prayer that Alcoholics Anonymous uses is a prayer for self-differentiation. God, grant me the serenity to accept the things I cannot change, Courage to change the things I can, and wisdom to know the difference. It is also a prayer to engage one’s destiny. To have serenity over the things that cannot be changed does not mean surrender or helplessness; it simply means to accept them and then use them as the boundaries to redefine one’s path. In the story of Great Expectations by Charles Dickens, Pip meets Miss Haversham. Now Miss Haversham is an aged spinster who continues to wear her wedding dress and has stopped all the clocks in the house at 20 minutes of nine. She was jilted before the wedding and now she waits eternally for her betrothed to come and marry her. Miss Haversham has tried to stop time and has tried to preserve the anticipation of her wedding that will never happen. This is not an act of engaging her destiny of circumstances. She has in the process of trying to control time become bitter and cruel. Nor is this an act of accepting things that cannot be changed. True, Miss Haversham cannot change the fact that she was jilted by her betrothed but it does her no good to pretend that it is forever 20 minutes of nine, frozen in time. While we might chuckle at Miss Haversham’s absurd and possibly insane behavior, I dare say that this happens more times than not, perhaps not to the same degree of insanity. Miss Haversham blames the way her life turned out on this man who jilted her decades before. She then allows her life to be defined by this tragedy instead of grieving the loss and then using her wealth and privilege to create a different life for herself. Miss Haversham did not engage in destiny instead she allowed events to define who she is and in the process became less of a person for it. Life is meant to be lived to the fullest potential and we each have a responsibility towards that endeavor. So let’s bring this idea of forging destiny closer to home. There are many things happening in our little part of the world. We each have our own unique genetic destiny. None of us know when our bodies will give out so our time of active engagement is limited, for some that limitation will be here sooner than later. And that statement has nothing to do with age because we all have known people whose lives came to an end far ahead of season. So there is that part of engaging our destiny. I have been engaging my genetic destiny by seeing to my health. I am losing weight, I am now walking three miles a day and I am on top of my medical stats of cholesterol, triglycerides, thyroid, and blood pressure. The question still remains to whether I will follow my father’s family or my mother’s in terms of years ahead of me. There is a sense of urgency for me if my father’s genes are dominant. My hope through my health actions is that I will tip the scales towards following my mother’s ancestry. How are you all doing in engaging your genetic destiny? There is my cultural destiny. I was born in rural New York State to a working class family. The community I lived in was relatively homogenous. Being born white and male gave me privileges that I came to understand early in life through a friendship in junior high school with a person of color. We challenged each other to read about Martin Luther King and Malcolm X. And we would discuss these books. Since she moved to the country from Harlem, her experiences were vastly different than mine. This gave me a desire to have different experiences than I could have in this rural community. I engaged my cultural destiny by moving to a city where there was exposure to other cultures. And I took risks to live in parts of the country that I never experienced before away from family and friends. All of this has given me a broader understanding of the human condition. And I continue to engage my cultural destiny by confronting racism and fear of multiculturalism. Then there is the cultural destiny that results from living in the first quarter of the 21st century in Alabama and America. Some of this is also circumstantial such as the recent laws against immigrants and the banks too big to fail economic crash. How do we engage this destiny? When I first moved to Mississippi and discussed where to begin addressing social justice issues, the response I received was point your arm in any direction and you will be pointing at an issue that needs addressing. It seems to be true here in Alabama as well. How do we engage this destiny? Can we have a say when history writes the final chapter on this era in American life? The past two weeks my heart has been heavy as I hear from immigrants the fear they are now living, regardless of their status, with the enactment of portions of this law. Even though additional portions were blocked from enforcement this past week by the 11th circuit appeals court, there still remains much that is heinous. The nullification of contracts that will result in the shutting off of water to suspected undocumented immigrants is a flagrant violation of human rights. Water is essential to life. The potential for a public health crisis looming as families begin living without access to water is enormous. I have begun exploring what I might possibly do to engage this aspect of our mutual destiny. I explored with the ACLU about the possibility of my standing in as contract holder for families whose water was shut off. This would be an act of civil disobedience. The consequence of this action could result in a Class C felony under HB 56 with fines up to $15,000 and ten years in prison. This new law has not been tested yet in the courts. Am I willing to do this? The idea of sacrificing my career which is what would happen because after ten years in prison, I would no longer be a good candidate for a long term ministry. I am not opposed to prison ministry but I would prefer to do it from this side of the bars. I am not sure that I am as brave as the Berrigan brothers were in the 1960’s and 70’s when they protested the Vietnam war by burning draft cards and then spent six years in prison. But I also do not want to be only an observer of this obscenity occurring in our state. I recognize that any act of civil disobedience that I might engage in Alabama needs to be done in relationship with you as the congregation I serve. Any action that I take will impact this congregation and if I continue to pursue this path of engagement, that day will come when I will choose to be arrested in civil disobedience. For me, civil disobedience has to be more than just blocking traffic. It has to be geared towards either breaking the law itself or preventing the law from being enforced in some manner, other wise the point is somehow lost to the masses. I am telling you this because this is where my mind is these days. The pain and suffering this law is causing our neighbors is real and unjust. This law is not about their entry into this country with out papers. This is about how we as a nation have time and time again treated immigrants as less than human. Every immigrant group that has come to this country has been vilified by the dominant culture. And our despicable treatment of people from Mexico and further south is not a new phenomenon; it is over 200 years old. It is time we put aside our hatred and bigotry once and for all. How do we engage this destiny in a manner that reflects our Unitarian Universalist values and principles? How do we forge a destiny that is more representative of a just and noble nation? I also recognize that my engaging my destiny may not be the same as your engagement with yours or even the congregation’s. We have members here who are engaging their circumstantial destiny in ways that is every bit as important to repealing HB 56 or any other unjust law in our society. The reason why it is important is because in their doing so they are finding ways to be the most alive they can be. In addition to the personal engagements to forge our destiny there are the engagements that are needed in order to forge our destiny forward as a congregation. And just as it is important for individual self-differentiation in engaging personal destinies there is the need for self-differentiation within the congregational setting as well. Leaders need to be self-differentiated because there are many opinions of what we should or should not be doing for our congregation. We need to be able to hear the words, hear the anxiety, without becoming anxious ourselves. Congregations are not about any one person, they are about the health of the group. How we handle conflict is important to this process. As a congregation we have circumstantial events that we need to engage.. We as a congregation can also choose to allow our ship to drift on the sea of destiny or we can engage with our ship and determine its course. The choice is ours to make. We have some challenges that we need to engage in soon if we do not like the direction in which we are drifting. We currently have no director of religious education. We currently only have a half time minister. This is a down ward drift from last year. We currently have no one to chair our stewardship campaign for the second year in a row. What will be the result of our stewardship this next year if we have no one to help direct this particular aspect of our boat? It will do us no good to bemoan our misfortunes. It will do us no good to bemoan the lack of volunteers. These bemoaning behaviors only keep us drifting away from our goal instead of moving towards it. We have the people here to do what needs to be done. If you have not done anything recently beyond attending Sunday morning, this is your invitation to get involved to help forge our future. It will take all of us looking out for each other to steer this boat into the future we want. All of us together to create the destiny we desire. Our congregation can be a contender in making a difference in the lives of our larger community. May it be so and blessed be. There are age old questions that humanity asks and one of them is ‘do we have a destiny to fulfill? Is there something written in the stars that determines my fate?’ In every culture there is a methodology for telling the future. Whether it is astrology, runes, I Ching, tea leaves, palm reading, or tarot cards; humanity in every culture attempted a variety of ways to discover its fate. And even if we do not use such external means to learn what lies ahead for us, we will do other things to help steer the course of this ship we call life. There is in Christian theology, a train of thought that God is outside of history and time. So all of history past, present, and future is moving towards the culmination of events as described in the Book of Revelation as the end of time where good and evil actions of souls will be judged either for heaven or hell. So the purpose of humanity according to this theology is to move history towards judgment day. This is the logic behind those who say we do not need to have environmental protections because to do so would thwart the culmination of God ordained events, the end of history. Or the rationale behind continued unrest in the Middle East because this is the place where the last battle will be fought before the second coming of Christ. It is certainly the logic behind the Dominionists who seek to create an American theocracy. So one’s destiny, according to this theological discourse is to further the will of God towards the culmination of time. And when I say the will of God, I am referring to groups of people’s belief of what that will of God might be, not that anyone has the franchise on knowing such information. Although there are many who claim to know. Even if one does not subscribe to this particular theology, the question remains, is there a destiny, some purpose to my existence, some role that I am to play out that I am to fulfill? Is there a way for me to know what that role is? Do I have any say at all in determining that role? Is there a sense of Destiny that each of us have? Rollo May, existentialist writer of the 20th century, would say yes. But he also ties destiny with freedom and this I believe is a crucial point. He writes, “The freedom of each of us is in proportion to the degree with which we confront and live in relation to our destiny[i]” So what is destiny? May defines “destiny as the patterns of limits and talents that constitute the givens in life.” There are four aspects of destiny that we need to consider in these patterns. We have the cosmic level of destiny, birth and death. These are two events that we have relatively little choice over. We had no say in our birth and we all will die. We might be able to have a say as to when we give birth to another or we might be able to postpone death by taking care of our health or even invite death through suicide but it is the destiny of each to die. In this category are also the so-called acts of god; tornadoes, earthquakes, tsunamis, hurricanes and the like. We might choose to flee a hurricane or decide to take our chances in the storm but these events occur with no consideration of us. The positive side of this includes the beauty of a sunset, the rolling waves of the ocean on a silky sand beach, the breeze on a hot summer afternoon, a walk along a wooded path on a fall day. Genetics play a role in our destiny. We have physical characteristics that we were given in our formation in the womb even if those characteristics were falsely assigned like being born female but embodying male chromosomes. What race we are born into, what color eyes were we given are part of this category. And May places our gifts and talents into this category as givens. Cultural aspects play a role in determining destiny. What family we are born into; wealthy or poverty stricken. We had no say in choosing our family or what country or in what part of the country we were born. And we did not pick the period of history in which we live. Our lives would be vastly different if this was Alabama in the early 18th century or mid 19th century or even the mid-20th century. And the final category that May defines is circumstantial destiny. These are events that happen in the world that we cannot reverse, avoid, ignore, or even ask for a do over. Events like 9/11, the invasion of Iraq or the collapse of financial institutions are events that have impact on our lives circumstantially and alter our world view. We may have little to no involvement in those events but they have changed the circumstances of our lives. We only have to think about airport security to see an example of how life has changed post 9/11. May places all of these forms of destiny on a spectrum with the extreme left hand position as being those events that humanity has no control over such as fate, determinism. In the middle he places the unconscious function of the human mind; partly determined, partly influenced by human behavior. Nearer to the right hand, he places cultural aspects because while we cannot control the culture we were born into there is freedom in how we engage that culture. And in the extreme right position he would place talents and gifts because while these are given to us, we have considerable freedom in pursuing or not pursuing the development of these talents. This definition of destiny is very different than the theological statement that destiny is somehow an expression towards fulfilling God’s ultimate end point of a judgment day. It is directly tied into our concept of freedom. Stephen Hawking is a brilliant man but if all you knew about him was the books that he wrote, you would have no idea that he suffers from Lou Gehrings disease, a debilitating condition that slowly over time removes all ability for movement. His destiny, perhaps genetic disposition, was this disease but he decided to engage the disability in a manner that enabled him to continue using his mind in extremely creative and liberating ways. All of our lives are richer for his engaging with the limitations of his body. For such a time as this. Haunting words but words that were needed for Esther to engage her destiny and find a way to entice the king to give her an audience and perhaps save her people. I think this question of having come to our royal position for such a time as this comes up to us in a variety of ways. In what ways are we being called to engage our destiny, our talents, our gifts, our limitations, our pitfalls and rise up to address a pressing need at hand? It might not be anything on a grand scale. It might be something seemingly insignificant to us but means the world of difference to another. There is a story [iii] that has been recycled through the internet several times, perhaps you have read it. It goes something like this, a young man who became very successful and renowned in his chosen field returns home for his highschool reunion. There he runs into his best friend from high school. He decides to tell his friend how grateful he was for having him as a friend all those years ago. The friend is a bit puzzled by this overture of gratitude. So the first one says to his friend, well do you remember the day we met. His friend laughs and says oh yes. You were carrying all these books home and some jerks knocked them out of your arms and I helped you pick them up. And we became instant and best friends. Well, the first friend says, I never told you why I was carrying all those books. You assumed I was just a study geek but you see, that day I decided to take my life. I didn’t want my parents to have to bother with one more thing like empty out my school locker. Your helping me that day when all was lost in my mind was the very thing that prevented me from choosing death. The friend looks at him stunned, knowing all the great things his friend has done in his life since that moment. His friend looked at him and says I was only doing what I would have wanted someone to have done for me if my books were knocked out of my arms. Exactly, and it saved my life, his friend says. Who knows if you have come to where you are in life for such a time as this. We do not always know how our lives impact another’s life. A gentle word may give someone hope. A touch may be a moment of not being so isolated. Many of these simple moments will be forgotten by you before the day is over but for the person receiving them, a world of difference. Having a sense of destiny isn’t about some lofty achievement that revolutionizes the world as we know it. Yes, lofty achievements can be a part of one’s destiny, one’s unfolding life as they grapple with the limitations that life has given them. But a sense of destiny can be in taking the time to examine the issues of the day against the values you hold dear. In doing so, you may be preparing yourself to be able to speak up against injustice in the world, whether that world refers to the culture as a whole or the classroom or the job site. A sense of destiny is found in discovering the freedom one has even with the limitations presented. There are new opportunities that can be found in those limitations especially when we decide to take risks. I know that I have shared with you some of my story regarding the founding of Interfaith AIDS Ministry but this is a story about my parting Interfaith AIDS Ministry. I had been with the organization that I co-founded for just over twelve years. I knew it was time for new leadership. I had taken the organization about as far as I could and I had accomplished my number one goal which was to develop an organization that when I left could continue on without having to revert back to ground zero. I thought that I wanted to work with another agency that was slightly larger that would bring new challenges. I began searching and no nibbles. So I decided that I needed to reexamine what my goals truly were. What did I want to accomplish in my life? What sorts of things did I really enjoy? Well I enjoy writing and I had ideas for some novels but some of these ideas needed different life experiences than I had had to that point in my life. I enjoyed doing the liturgies for the interfaith prayer services we offered at the agency. I enjoyed the pastoral care aspects of the position. I enjoyed the opportunities to give sermons. So I took those aspects that I enjoyed and began pondering what I might need to do in order to find a position that would give me more of those experiences. This was engaging my destiny. I was in one place that had limitations for me and I wanted to be in another place that I perceived would open some new experiences for me. I took my time to listen to the silence between the spaces. I enjoyed this aspect of my life. Pause. I enjoyed that aspect of my life. Pause. And in taking the time to listen not only in the midst of performing an activity that I enjoy like writing, but also listening in the midst of not writing, of not doing anything, I began to gain a sense of what I wanted in my life. And perhaps more importantly, I began to get a sense of what my destiny might be unfolding for me and the willingness to take a risk and go to seminary in a different state far from anything I had ever known before. The classical pianist Artur Schnabel is quoted as saying, “I don’t think I handle the notes much differently from other pianists. But the pauses between the notes—ah, there is where the artistry lies!” It is in the pauses that we get a chance to find the artistry of living life. May writes, “Pause is the prerequisite for wonder. When we don’t pause, when we are personally hurrying from one appointment to another, from one ‘planned activity’ to another, we sacrifice the richness of wonder. And we lose communication with our destiny.” To engage with our destiny we need to take time to pause and simply be in the stillness of that moment, to savor all the richness of that which has gone before and that which is about to be. What is our individual sense of destiny? And what is our collective sense of destiny? These are very different questions and they are worth taking the time to pause, to ponder, to wonder. Perhaps we are being prepared for just such a time as this. Blessed Be. [i] Rollo May, Freedom and Destiny, 1981, WW Norton & Company. All quotes by Rollo May in this sermon are from this text. Personal note: This is my favorite book, I have read this text many times since it was first published in 1981. [iii] Source of this story is unknown. It is most likely a fictional story used to spread a moral message. The story of Jericho from the Hebrew Bible is about Joshua and the Israelites who defeated the city of Jericho by marching around the city seven times and then with a sound of a rams horn, the walls collapsed. The walls of Jericho in our analogy is HB 56 which seeks to divide our state, our communities, and our families between citizens and the undocumented. This wall of division, wall of hatred, wall of racism must come down in order for Alabama to transcend its history and become a state where all people are free to pursue life, liberty and the pursuit of happiness. On October 2 I led such a walk around First Baptist Church in Tuscaloosa. This is the congregation that Governor Bentley attends. The congregation, however, offers hospitality to the immigrant community. They offer several English as a Second Language courses to the Latino and the Chinese immigrant communities here. They provide a vibrant worship community for these immigrants which empowers the ability to live here. They are living their faith tradition which commands its followers to offer hospitality and welcome to the stranger, the foreigner, the immigrant. So our walk had to be respectful of this ministry and yet point out the contradiction. We decided to thank First Baptist for their hospitality and point out that HB 56, where at least one of their members is a strong proponent, seeks to violate theirs and many others’ faith traditions call to be hospitable. As we walked around the building, some of the people within looked out the windows and waved. 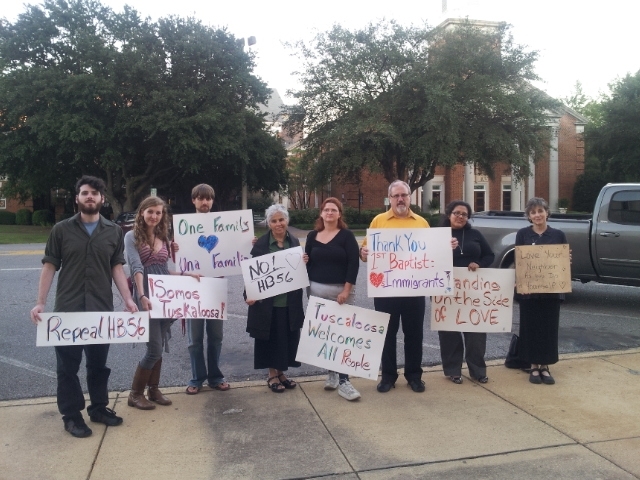 We showed them our signs, “Thank you First Baptist: Hearts Immigrants,” “Somos Tuskaloosa,” “Repeal HB 56,” “Tuscaloosa Welcomes all people,” and “One Family Una Familia.” The on lookers gave us a thumbs up. People in cars going to the church waved. They seemed to get it. The walls are tumbling down. We will win this. The ram horn of justice is about to blow loud and long. Members of Somos Tuskaloosa in front of First Baptist Church.